The Raynes Park plasterer plastered this modern hole-in the wall fireplace. The old 1930's fireplace had been removed & the new fireplace installation required making good to the surrounding brickwork before skim plastering. By using angle beads our plasterer was able to achieve sharp straight line edges in keeping with the desired contemporary look. 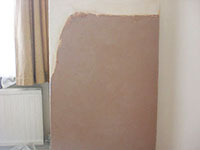 The Raynes Park plasterer was asked to repair a wall areas in a lounge where an old damp problem had caused the plaster to fall off. As the damp was now gone, our professional plasterer was able to make good the affected area by scraping back & using backing plaster where necessary. Finally the area was left smooth & polished using skim plaster ensuring tidy joins with the old plaster & leaving the area ready for painting.